This article originally appeared on Mountain West News. Since then, oil prices have nosedived from around $100 per barrel to, for a time, less than $30. The tribes have three wells in production today. They’re not the kind of horizontally drilled and fracked wells that unlocked the Bakken boom, mostly around Williston, North Dakota, about an hour’s drive east from Poplar, the seat of the Assiniboine and Sioux. Such wells have eluded the tribes, and with today’s oil prices, there’s no incentive for exploratory drilling that might yield one. Rather, these wells are decades old, and the tribes are likely losing money each time the few pumpjacks churn, penetrate the earth, and draw crude that Shell eventually hauls away. A vertical oil well on the Fort Peck Reservation. That was the case over fiscal year 2015, Smith says, when the tribes’ wells operated at a loss, compared to the roughly $2 million that flowed to their general fund between the fiscal years of 2010 and 2014. Susie Perry, the tribes’ deputy finance manager, says the portion of the $75 million settlement reached in 2012 with the U.S. government allocated to individual tribal members “contributed to the upswing in our gambling.” Gaming revenues from the reservation’s three casinos are up about 25 percent, she estimates. The Baker Hughes rig count as of March 11, 2016. Wolf Point is roughly seven miles west of the Fort Peck Reservation’s south-central boundary. The Bakken oil boom tribal leaders and many members had been hoping for never materialized, despite them having leased more than a quarter of the 2-million-acre reservation to oil companies. And a boom won’t arrive any time soon, if ever. Geology, technology, and oil prices will determine that. Smith describes the mood as “doom and gloom.” On a reservation with a tribal unemployment rate of 57 percent, as Chairman Rusty Stafne reported last year, that mood tends to prevail regardless. Missing the boom, though, largely insulated the tribes from the bust — one that arrived much more quickly than most economists had predicted. Today there isn’t a single drilling rig in all of Montana. The growing pains that accompanied the boom around towns such as Sidney, Montana, and Williston, North Dakota, as well as on the Fort Berthold Reservation at the center of the Bakken in North Dakota, have been replaced by the vacuum of economic contraction. Map courtesy of the Federal Reserve Bank of Minneapolis. Daniel Farr is the superintendent of schools in Sidney, less than 10 miles from North Dakota. He paid for college working as a roustabout in the oilfields of Gillette, Wyoming, and later as a roughneck on a drilling rig in eastern Montana. “The work is crushing,” he says. Which is why he calls laboring in the oil patch a “young person’s game.” And why the school district’s hike in enrollment, resulting from the Bakken, has largely been among the children of those young workers, kindergartners through eighth-graders. The elementary student count jumped from 711 during the 2007-2008 school year to 945 during 2014-2015 — a one-third increase. Photo courtesy of Beagle Properties. The 2013 Montana Legislature passed a bill adding a new concept to school-district funding called “concentric circles,” designed to share oil and gas revenues among districts heavily impacted by development. In Sidney, Farr says, that meant oil money flowing to the elementary school jumped from $1.6 million for the 2012–2013 school year to $7.1 million a year later, and $6.2 million a year after that. During the boom, the building in which Farr works, where classes hadn’t been held, was taken “out of mothballs, so to speak,” and currently holds 330 students. The district doled out what it called impact stipends of $3,000 to about 100 certified staff to help with the increasing day-to-day costs of living in Sidney. As rents spiked, the district leased affordable mobile housing to some staffers. And then the global chess game that determines oil prices sent Sidney and its school district spiraling. “Now that we’re in this boom and bust cycle,” Farr says, “the total amount of oil and gas money my elementary school district has received through three quarters this year is a little more than $637,000.” Rental rates have dropped to the point where the cost of employee housing is now higher than rentals around town, and Farr says he “can’t compete with people who couldn’t compete with me a year ago.” He’s grateful the leases expire in August. But enrollment, at least for now, has remained steady, Farr says. Staffing needs are the same. Students’ needs are the same. The money, though, has evaporated. Still, what’s happening now is something of an orderly restructuring. Farr says 50 percent of the district’s current staff is “on hold,” non-tenured, waiting in limbo to see how much enrollment drops and whether they’ll be leaving the district, too. The school recently surveyed parents of children in first, second, and third grades. Farr says about half of them indicated they’ll be leaving Sidney by the beginning of the next school year. The other half were undecided. The surveys are ongoing. Needless to say, how the numbers shake out has led to “a lot of anxiousness” among teachers. The district’s considering a mill levy request of $400,000, which would be the most it’s ever asked of taxpayers. Farr expects to reduce that amount by cutting budgets where he can. “It’s just understanding the economy out there for a lot of people,” he says. But the town’s budget swings are telling. The budget climbed to more than $21 million during the peak of the oil boom, about $9 million more than “under normal circumstances,” according to Norby. The city cut $700,000 from last year’s budget and will likely cut $400,000 more this year as it continues to rightsize. Normal, though, becomes more difficult to define in communities prone to boom and bust cycles. In April 2014, the U.S. Energy Information Administration released its Annual Energy Outlook with production and pricing projections to 2040. Its oil predictions, based on the Brent crude oil price, the global benchmark, ranged widely. Depending on various factors, the “High Oil Price” scenario suggested a climb from $100 per barrel to more than $200 (in 2012 dollars) by 2040. The “Low Oil Price” scenario suggested a sudden drop to roughly $70 per barrel this year and then a slow and steady rise to about $75 by 2040. The EIA’s Annual Energy Outlook 2014. As we know now, even the EIA’s “Low Oil Price” scenario, at least in the short term, is turning out to be very optimistic — about double current prices. The global benchmark dropped to as low as $26 per barrel in January. The price stood at $39 as of March 7. The domestic benchmark, the West Texas Intermediate, or WTI, hovered around $34 the week of Feb. 29 before rising to about $38 by March 7. And where it goes next is virtually anyone’s guess. Thirty years of WTI spot prices. The EIA’s certainly not alone in failing to predict the dramatic drop in oil prices. Rob Grunewald is an economist with the Federal Reserve Bank of Minneapolis and studies the Bakken. He says that in 2012 and 2013 there were many energy economists arguing that oil prices wouldn’t drop below $70 per barrel. Myriad global, volatile factors affect oil prices, but it comes down to supply and demand — even in a world with a well-honed oil cartel, OPEC — and today there’s simply too much supply. According to a Feb. 17 report by Lynn Helms, director of the state’s Department of Mineral Resources, North Dakota sweet crude was selling for $16.50 per barrel, the lowest price since February 2002, and an 88 percent plunge from the all-time high of $136 in July 2008. The price Bakken oil fetches is typically lower than the domestic benchmark, largely due to transportation constraints. But the differential fluctuates, and at times Bakken oil has sold at a premium based on the mode of transportation (rail or pipeline) and to which region of the country it’s headed. Across the entire U.S., Baker Hughes, an oilfield technology firm that tracks drilling activity, counted 386 rigs as of March 11, compared to the all-time high of more than 1,600 in October 2014. But even as the incentive to drill has vanished, established wells continue to pump crude. Helms’ report shows that between December 2014 and December 2015, Bakken oil production fell from 1,227,483 barrels per day, the state’s all-time high, to 1,152,280 barrels — a reduction of only 6 percent. That helps keep supply high, and prices low. And even if a company operates at a loss overall, it’ll likely keep producing to generate cash to service debt and maintain short-term financial viability. As Grunewald reported in a recent article, the Bakken region lost almost 15,000 jobs across all sectors between the fourth quarter of 2014, the peak, and the second quarter of 2015. That data, the most recent available from the Bureau of Labor Statistics, is about a year old, when oil sold at nearly double current prices. In Montana’s three Bakken counties — Richland (where Sidney is the county seat), Roosevelt, and Sheridan — Grunewald’s data reveals, between the fourth quarter of 2014 and the second quarter of 2015, a 17 percent drop in oil industry employment, a 29 percent drop in construction employment, and a nearly 10 percent dip in total average weekly wages. In other words, it’s stopped fracking altogether. So has Whiting Petroleum, another of the Bakken’s largest players. It announced in February an 80 percent capital budget cut this year. Last week the company announced that it expects its credit line to be cut by $1 billion in May. The Fort Berthold Reservation in North Dakota, home of the Mandan, Hidatsa, and Arikara Nation, hit the jackpot. It sits atop some of the deepest Bakken pools, oil that has turned the nation into one of the wealthiest in Indian Country. As has been widely reported, the tribes’ newfound fabulous wealth led to corruption in government and a spike in drug abuse and crime. Just a few weeks ago, a business partner of former three-term tribal chairman Tex Hall was found guilty of two murder-for-hire killings. Hall was a government witness in the trial. An oil well on the Fort Berthold Reservation. Hall’s mantra was “sovereignty by the barrel,” the idea that oil wealth can foster self-determination and remedy the wrongs foisted on the tribes by the federal government, such as building the Garrison Dam on the Missouri River in the 1950s. The dam flooded the heart of the reservation and forced communities to move from river bottoms to less-productive high plains. The tribes’ wells account for roughly 17 percent of North Dakota’s total oil production. As of Feb. 17, the 1,426 active wells on the 980,000-acre reservation were yielding 192,304 barrels of oil per day, about 35,000 barrels shy of Wyoming’s current per-day volume. Beginning July 1, 2008, when the MHA Nation and state agreed to split oil tax revenues on the reservation 50-50, the tribes have generated more than $760 million, according to North Dakota’s tax commissioner. As part of the revenue-sharing agreement, the tribes waived their own oil and gas severance taxes. 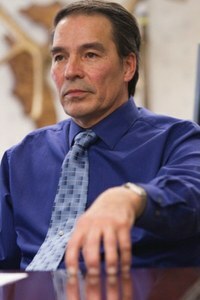 “Given that the financial circumstances of the MHA Nation have changed dramatically, due to the sharp drop in oil prices, the new administration must demonstrate a calm and steady hand so as to reassure the tribal people that essential tribal services and social programs will continue as usual,” Cross wrote. A natural gas flare on the Fort Berthold Reservation. He considers this a significant challenge, because the mentality of the tribes and its members, in his view, is one that fails to recognize the costs that have accompanied the oil boom’s benefits. He says the tribes generally perceive oil wealth as free money, even when tax revenues and royalties drop along with the price of oil. But the costs are significant, Cross says, and include damage to the tribes’ last remaining patch of aboriginal lands, and an oil-tax arrangement with North Dakota that, he believes, compromises sovereignty, instead of advancing it. On March 6, a bad valve connection on a pipeline near Williston, North Dakota, led to 2,733 barrels — more than 114,000 gallons — of saltwater to breach a well pad and leach into a dry creek bed. It was the 12th largest saltwater spill since the Bakken boom began. “It looks like it hit that sandy soil and just soaked right in,” said Bill Suess, the spill investigation program manager in the state’s Department of Health. Only 215 barrels were recovered, according to the incident report. The company responsible, Zavanna LLC, has reportedly had 55 oilfield spills since 2012. A downtick in oil and wastewater spills has accompanied the slowdown in drilling, but the numbers remain staggering. Suess reports that in 2015 alone there were 901 spills that included oil as among the contaminants, and 631 that included saltwater. The 20,600-barrel Tesoro oil spill cleanup. Courtesy of the North Dakota Department of Health. The largest saltwater spill poured 70,000 barrels — nearly three million gallons — of saltwater, along with 90 barrels of oil, from a pipeline into and around Blacktail Creek, north of Williston, on Jan. 7, 2015. The ancient brine in deep aquifers pumped to the surface with oil is at least 10 times saltier than ocean water, similar to the salt concentration of the Dead Sea. High salinity in soil can render it sterile. More than 10,000 wells dot the North Dakota Bakken. Suess has five full-time and three half-time staffers, along with occasional volunteers from other departments, to oversee spills and remediation. “It’s definitely a challenge,” he says. He is only able to send two people into the field each week. Blacktail Creek after the saltwater and oil spill in early 2015. On the Fort Peck Reservation, the Fort Peck Energy Company folded last November. It was co-owned by the tribes and Native American Resource Partners, a private investment firm based in Utah. In 2013, NARP vice president Lynn Becker, who lived for a time in Wolf Point, the reservation’s largest town, told me that NARP’s business model is based on the belief that the country’s 55 million acres of tribal lands are “either underexplored or highly unexploited.” He pointed to a map of the reservation on the wall in his office, a map he saw as essentially blank, because there were no oil wells. “Here on the reservation, we just need a great discovery — you know, someone to see that, ‘Yeah, the Bakken oil is here for sure, and this is how we’re going to get to it,’” Becker told me. Becker had led the Fort Peck Energy Company’s efforts to acquire leases and piece together a 45,000-acre block in the southeast corner of the reservation, closest to Montana’s productive wells. The company paid most landholders $50 per acre. Forrest Smith says about half of those leases will be expiring this year and the other half next year. Becker left Montana altogether in August 2013. Former NARP Vice President Lynn Becker. On the reservation, it’s been the promise of the Bakken that’s busted. Tribal leaders, though, never considered the Bakken a panacea. When oil prices were high and oilmen like Becker rounded up leases, the tribal chairman at the time, Floyd Azure, called the prospect of a boom a “double-edged sword.” The manager of the Fort Peck Office of Environmental Protection, originally from Williston, said the landscape there “is just getting torn to smithereens, and it’s hard to look at.” The director of the Fort Peck Tribal Employment Rights Office acknowledged that very few tribal members have the necessary training to work on oil rigs, and that the benefit would largely come not from jobs, but from lease payments and royalties. And the tribes are still dealing with the devastating effects of oil drilling in the ’50s that poisoned groundwater. Floyd Azure, former Fort Peck tribal chairman. Drilling began northeast of Poplar in 1952. Back then — as was the case in 2012 and 2013 when the tribes drilled horizontal Bakken wells in that southeastern corner of the reservation — the oil companies pumped to the surface more water than oil. Those companies disposed of the saltwater, contaminated with carcinogenic benzene and other compounds, in unlined pits. Holding tanks, pipelines and plugged oil wells leaked. Over the course of five decades, billions of gallons of brine seeped into Poplar’s drinking water aquifer. Between 1999 and 2010, the Environmental Protection Agency issued five emergency orders to three oil companies, forcing them to, among other things, build a drinking water pipeline to certain residences and deliver bottled water to others. More than 10 years before the EPA’s first emergency order, the tribes, having already detected high levels of chloride in wells, began planning a pipeline to draw clean water from the Missouri River. Congress authorized funding in 2000. In 2012, water began flowing from a new treatment plant on the Missouri River to Poplar, and eventually to other communities on the reservation via 3,200 miles of pipeline. For the time being, it’s moot, for better or for worse.